Join George and his dog Milly in a journey around the world with a book so interactive it's almost a real-life sightseeing trip! This is the maze book to top all maze books! Help George find a way around a half-page maze then flip the pages over to find where to go next by working out which page the maze connects to. 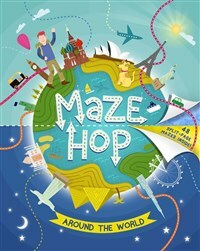 The mazes lead you through a series of countries featuring cities, landmarks and habitats. As you travel, find fascinating facts and stats about each location and look out for fabulous things to spot! Anna Brett has worked in children's publishing for over seven years and has written and edited a huge variety of books. Her experience spans everything from curriculum-based reference to popular culture and books with digital extras, pop-ups and stickers. This means she's used to thinking upside down and back to front when it comes to fun activities for children!